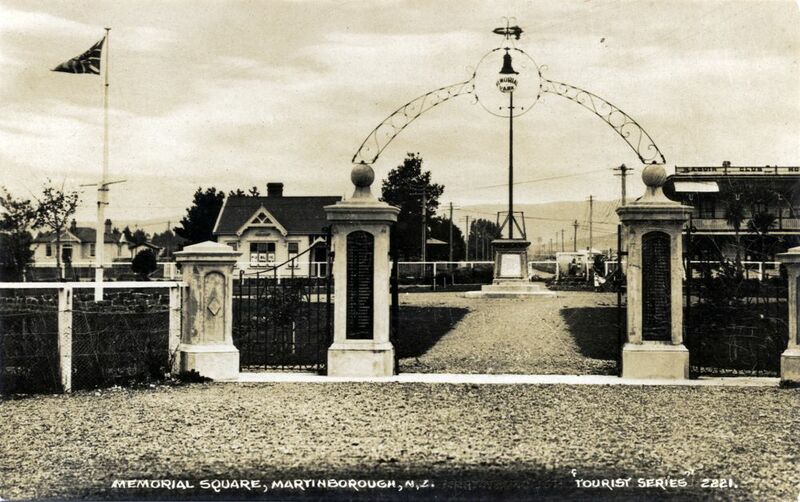 The newly-installed Memorial Gates in Memorial Square, Martinborough, about 1925. The South African War memorial is beyond the metal arch. Martinborough’s Memorial Square contains the war monuments for the South African War (Boer War), World War One and World War Two. The concrete work was by Arthur Dohnt, while the ironwork was made by Arthur Tyler. Beyond the gates a path led to the square’s centre where the Boer War Memorial stood. In that era the square was enclosed by a white fence and contained few trees. The memorial was built in 1921 and unveiled on Sunday 16 October by MP William Downie Stewart, an ex-serviceman. The cost of £600 was raised by public subscription. Local MP Alexander McLeod and a clutch of other MPs attended and the cadets of Martinborough District High School formed a guard of honour. Shortly after the World War One memorial was unveiled, the square’s name changed from Martin Square to Memorial Square.